The City of Rossland has once again allocated grant funds to community organizations as part of the community support program. 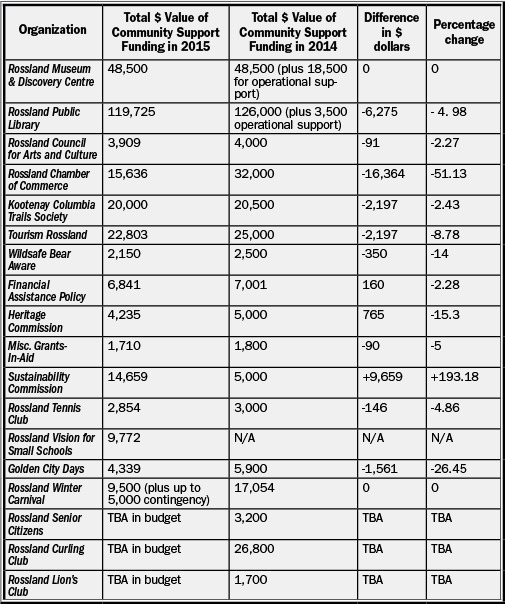 The table below identifies entities that received funding in 2015 and compares it to the amount received in 2014. Ultimately it is the tax payer who pays for these community organizations and while the council determines how the funds are spent, community members can still have their say. Mark your calendar for the public council meeting on March 23 where council will be discussing the outcomes of the public engagement in regards to the city budget. “Some community groups were disappointed that they did not get the grant money they requested. Council really struggled with this year’s allocation,” said Mayor Kathy Moore. This is a result of infrastructure and capital reserves being neglected over the years. Now council has to meet the deficit and play catch up to continue operating at the same level.“We set a cap of seven per cent of tax revenue for this purpose,” said Moore. If you are interested to learn about council decisions and find out how to have your say, come along to the next council meeting scheduled for March 23 at 6 p.m. Agendas are available from the city website rossland.ca/agendas-and-minutes prior to the meeting.